A young boy named Matthew watches his father doing some generic purposeless farm work. The boy slowly gets onto a tractor and- just when the timing is right!- he purposefully runs his dad over, leaving a broken, bloody ruin of a man that looks a lot like a mannequin. Then Matthew leaps off the tractor and seemingly against the laws of physics he manages to run over his own hand! In other words this kid is a psycho and also incompetent, and if that is not a recipe for hilarity I don't know what is. Matthew is sent to a mental hospital, his hand replaced by a hook! Then one day adult Matthew receives a letter from his mother. Turns out she has met some guy named Mr. Parsons and is getting married! Matthew looks at the paper with hatred in his eyes. "...Mr. Parsons!" Mr. Parsons is a great guy and is trying his hardest to bond with Matthew but Matthew will have none of that and the only bonding Parsons will be doing in the near future is the very special kind between his chest and an axe. Mom finds out and in the ensuing struggle she falls and hits her head on a rock, dying instantly. Matthew runs away, killing people as he goes, until he meets Vera who is a part time painter and part time prostitute... and who Matthew decides he must protect from all the men who want to touch her. 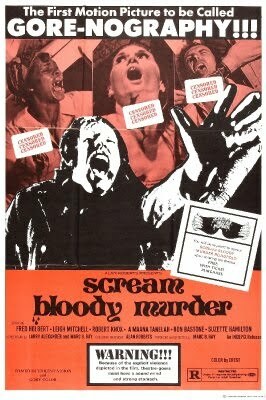 Scream Bloody Murder is a fine little exploitation shocker. Matthew is annoying as hell and every time he tries to talk to someone you just want him to shut up. This is a slasher from before the 80s, so not all the victims are instantly detestable which means you do feel bad for them when Matthew flips out on them. This is really a key point if you are trying to make a slasher but don't have the budget of a Friday the 13th or an A Nightmare on Elm Street. The latter Nightmare on Elm Street films can get away with annoying characters because they are primarily special effects flicks. Scream Bloody Murder was made for less than I spent on my dinner last night, so having sympathetic characters helps a lot. 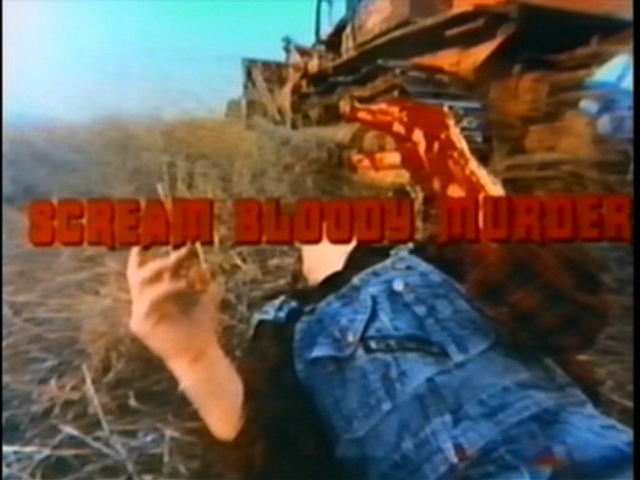 Scream Bloody Murder is unfortunately not an Italian gore movie from the 70s, so it doesn't really have any really crazy stuff in it. Though at one point towards the end Matthew develops teleportation powers! He corners a woman in a room upstairs and she escapes, makes a mad dash for the front door, but when she opens it Matthew is there waiting for her outside the house. I guess coming from the guy who managed to fall backwards off a tractor, landing in front of the tractor so his arm could get run over, this is not too surprising. If only you had used your powers and your claw for good, Matthew!